Thanks for your help and feedback last weekend. After reading and measuring some more, and taking lots more pictures, I've eliminated most of the possibilities that I originally showed you. I'm currently favoring these three. They are wide enough (I think), not too deep (I think), oval shaped and half-rimmed, and not too heavy. They all have adjustable nose pads for my overly-wide bridge. What are your thoughts? What am I missing? Is there a clear winner or loser? ETA: Found a wider set in brown and black (#4-5). They're a bit heavier than the others, but probably not un-doable. Everything wider than this and also oval half-rimmed is wire frame. I love that red on you! It's dark enough that it almost reads as neutral. Of the other two, I prefer the blue, as I don't love the temple detail of pair #2. I find it a tad distracting. Thanks Jenava! Do they look wide enough to you? They are 1 mm narrower than my current pair, which I like the fit of - but the selection at the wider width was quite a bit narrower. Hey Amy - I looked at your initial thread about your glasses and had absolutely NO idea! I really don't know how to figure out or what to look for when it comes to deciding on lens shape, color, etc.! How about you title this thread an "Ask Angie"? That way she will for sure chime in and get you sorted! Here's an even wider option that I think is also okay - available in brown or black. Great idea Marley - thank you! I like 1 or 3 from the first grouping shown. I think either the dark red or the blue would be great colours for you. 1-3 are more rectangular then oval and I prefer that shape on your face. 4-5 are ovalish. i think the dark red or blue are my favorites of those 3. Wow, I am finding it really hard to determine due to the reflection on the lenses themselves. I think I like the last pair you show (second set of photos) but I'm not very confident in this choice. 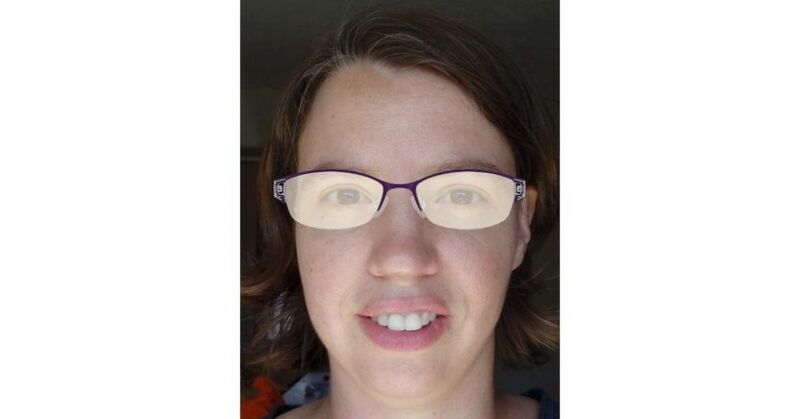 Suz, thank you - the glare on the lenses is really bothering me too. On some frames it's not there, and on others, it's much worse than these. I am not good at glasses picking by the picture, but like Suz I am going to tentatively go for the ones in the last two pictures you added. I've missed a bunch of this, and am terrible with glasses & fit (you'd laugh at mine), but I just wanted to say that I really love the first red ones on you. I like #1 best from this selection, Amy. The dark red is brilliant on you. Not sure nose pads are the way to go though. Have you tried specs without them? Angie - Thank you for you input! Both my current specs and my previous pair are without nose pads. However, on my current pair, the bridge is too narrow, and pinches my nose. Because they're hard plastic frames, this isn't adjustable (and therefore I rarely wear them - they're painful after a while). I chose to limit my options to ones with the silicone nose pads because I know they are adjustable. However, I could measure the bridge of the specs, and see if I can find ones that will be wide enough without needing to be adjustable. I'll try it.